Mega Cat Studios will be launching a Kickstarter on September 12, 2018 for Log Jammers, an arcade sports game. The indie studio is known for publishing retro cartridges for the NES, SNES, and Genesis, but it also creates digital versions of its games for fans to play on modern hardware. This Kickstarter would cover the cost of porting Log Jammers to the PlayStation 4, Xbox One, Nintendo Switch, and Steam. 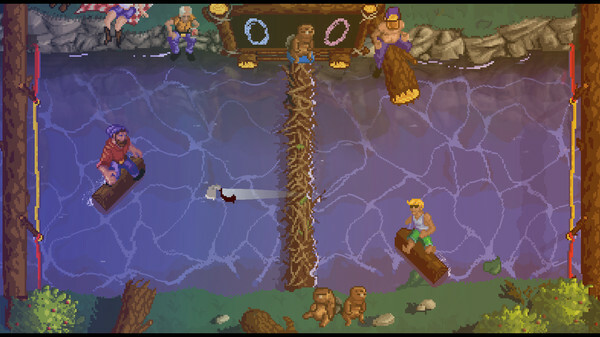 Here’s a Log Jammers trailer. Slam your axe into your opponent’s goal in fast-paced blade tossing carnage! Activate power-ups to set your blade ablaze or cover your opponent in slippery oil! Grab the star to unleash each character’s unique special throw! Choose a timber beast with a level of speed, technique, and swoleness that suits your play style! Jam out in funky arenas like a mayonnaise factory spill, 80s hell, and a peaceful beaver pond! Revel in victory as your lumberjack trash talks your vanquished opponent! Amp up the body count in cheerleader mode! Fans who are eager to get a sense of the game can play a demo on Steam. While we often see smaller IPs from indie studios show up on Kickstarter, it is important to remember it isn’t only for new IPs. Want another indie while you wait for Log Jammers? Check out our list of the best PS4 indie games.